Saint Augustine (354-430) is one of the most influential thinkers of the Western World. His answers to life’s profound questions shaped Western civilization to an unparalleled degree. How did the Middle Ages come to know this great Father of the Church? How did his large oeuvre survive the nearly sixteen centuries since his death? This is the sixth in a series that looks over the shoulder of medieval readers to discover how they shaped Augustine’s legacy, and created an image of the man that has endured to our times. When I behold the vast, diverse, highly intelligent work of late-antique and medieval authors, I am often astonished at how they achieved so much given the many obstacles put up by their time: the dangers of travel, the frequently unstable and plain dangerous political climate, the lack of solutions for physical impediments, the absence of the many technologies we are addicted to today to facilitate our work. This sense of wonder hits me, of course, when I contemplate Augustine and his 5,000,000 words, but perhaps even more so when I look at Bede the Venerable. After all, Augustine still lived in the Roman Empire, an institution whose reputation for efficiency is legendary. Bede, on the other hand, had to carve out his life as a monk in a relatively new monastic community, in a corner of Northumbria, a country where just a few decades before he was born (c. 672) Christianity had no foothold at all. Depiction of the Venerable Bede (CLVIIIv) from the Nuremberg Chronicle, 1493. A telling anecdote in this regard is the well-known story that while Bede was still a teenager, a plague wiped out almost everyone in the monastery. Bede and his abbot Ceolfrith were the only survivors qualified to carry on the church services, and they did so between the two of them until reinforcement came from the outside world. Today, I would like to try to transfer some of my appreciation to you. I will give you a taste of Bede’s many accomplishments, not the least of which is his instrumental role in the diffusion of Augustine’s works. The first of Bede’s accomplishments relates to the title of this piece. I never could resist a good alliteration, but what a post on Bede’s connection to Augustine has to do with angels, is perhaps not immediately clear to anyone who is not English. The title refers to a pun that Bede records in his Historia Ecclesiastica. Near the end of the 6th century, Pope Gregory the Great’s attention was drawn to some fair-haired, fair-skinned slave boys in an Italian slave market. Upon hearing that they were Angles (i.e. originating from what is now England) the Pope apparently retorted ‘Not Angles but angels.’ This story, framed as it was in Bede’s monumental historiography, is considered to be the seed of the notion of one ‘English’ people, so Augustine’s works in Anglo-Saxon libraries indeed found themselves surrounded by ‘angels’. With this reference to the Historia Ecclesiastica we have covered Bede’s greatest accomplishment, a historiographical work that earned him the name of ‘Father of English History’. Aside from the historical-political arena, Bede also dabbled in the sciences. He wrote a treatise on the computation of time and was particularly passionate about determining the correct date of Easter, a subject which had been highly controversial for a long time, because errors in the dating could have dire consequences – eternal damnation. Computing dates in the medieval period was a complicated business, as manuscripts loaded with tables, lists and graphs tellingly illustrate. As part of his calculations Bede introduced one thing that has proved very influential: it is essentially because of him that we use ‘AD’ or ‘Anno Domini’ as part of our system of dating. As is often the case with medieval scholars and authors, Bede would likely not have been able to do what he did if he hadn’t had access to a substantial collection of books. They arrived courtesy of the first abbot of Monkwearmouth, Benedict, who came back from his travels to Rome laden with manuscripts to supply the new monastery. While the impressive library curated at Monkwearmouth-Jarrow cannot be tagged onto Bede’s resume, what he did with it is certainly noteworthy. Bede conceived of and executed what one scholar called ‘the most ambitious and carefully planned program of Biblical commentary since Late Antiquity’. 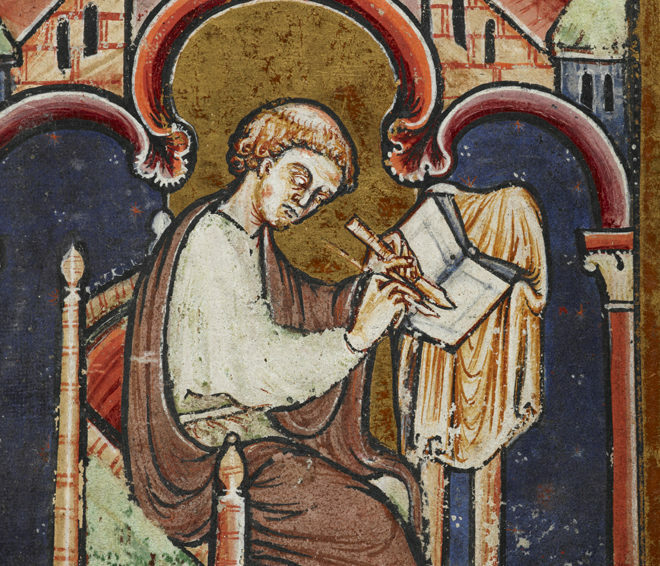 Bede composed commentaries on a large number of Bible books, both Old and New Testament. While most of these combine Bede’s original writing with numerous quotations from the works of the Church Fathers, two of them consist entirely of excerpts from the works of Gregory the Great (on the Song of Songs) and Augustine (on the Pauline Epistles). The latter, known as the Collectio, consists of no less than 455 fragments from about 40 different Augustinian works. Bede’s Pauline commentary of Augustinian quotations was a valuable resource for several Carolingian scholars, who used it as a kind of index of Augustine’s works. The reason it could function as such is that Bede identified each work, not only by title, but in most cases also by book and even chapter division, making it unusually easy to use. This diligence and efficiency are not completely unheard of in the medieval period, but Bede certainly seems to have been a cut apart. Whether this really was a case of OCD, as the title of this section plays at somewhat disrespectfully, or not, it is a quality that modern scholars are exceedingly grateful for, as for several of Augustine’s works, Bede’s Pauline commentary forms the only attestation of their circulation in Anglo-Saxon England and for some works, it is even the only attestation, period. Bede’s impressive exegetical program, combined with his practice of careful identification has kept several of Augustine’s works – sermons, but also treatises – from disappearing altogether. During Bede’s lifetime, the dual monastery he called home grew to be a thriving religious and intellectual center, housing some 600 monks and playing an instrumental part in the diffusion of books – and therefore knowledge – both in Anglo-Saxon England and on the continent. He died on 25 May 735, England’s leading scriptural and historical authority, after a life that was – as all the evidence suggests – a very busy one. Next time we will be paying a visit to Charlemagne’s court, to look at Augustine’s role in the Carolingian Renaissance.